The year is 1876. Inthe small Sierra Nevada settlement of Lost Pine, the town witch, Emily Edwards,is being run out of business by an influx of mail-order patent magics.Attempting to solve her problem with a love spell, Emily only makes thingsworse. But before she can undo the damage, an enchanted artifact falls into herpossession—and suddenly Emily must flee for her life, pursued by evil warlockswho want the object for themselves. Dreadnought Stanton, a warlock from New YorkCity whose personality is as pompous and abrasive as his name, has been exiledto Lost Pine for mysterious reasons. Now he finds himself involuntarily alliedwith Emily in a race against time—and across the United States by horse, train,and biomechanical flying machine—in quest of the great Professor Mirabilis, whoalone can unlock the secret of the coveted artifact. But along the way, Emilyand Stanton will be forced to contend with the most powerful and unpredictablemagic of all—the magic of the human heart. I’vebeen into “weird west” books recently. Weird west is different than what Iusually read, and the difference really appeals to me. I’ve read two westernthemed books before The Native Starand I enjoyed both. While I was aware that TheNative Star had a bit of romance in it, I decided to give it a shot and seehow I liked it. It seems like most people enjoyed this book. I think I missed that boat. The Native Star opens with a scene whichpretty much sets the tone for the rest of the book. Our protagonist, hedgewitch Emily Edwards, in an attempt to make her adopted father’s life easier,decides to cast a love spell on a well-to-do man who lives in her town. Sheoverdoes the spell, thus setting the stage for the rest of the book. Imust admit, this opening scene caused me to roll my eyes a bit. Our dear Emily Edwardsis the very definition of cliché. She’s different than everyone else, whichmakes her feel lonely and isolated. She has a mysterious past which is neverfully uncovered but hints to greatness, and somehow, through her own naiveté, stumbles into a problemmuch bigger than anything she can handle, thus forcing her to embark on anadventure grander than her wildest imaginings. Of course, Ms. Edwards wantsnothing more than to return to her small-town Nevada abode, which, after allthe mistakes she’s made, she knows she’ll never be able to do. Cue tears. I’msure you can guess that, through this adventure, Ms. Edwards decides that herreal love-interest is the very man, surly and cold though he is, that she isstuck with on her cross country journey. I usually wouldn’t put something likethat in a review, in fears of adding spoilers, but seriously, people, how muchof what I’ve said so far haven’t you already guessed? That’sthe real problem with The Native Star.It’s so completely predictable. Set in a cozy-yet-different western location,with an incredibly charming magic system, some steampunk elements and acharacter who, despite all my qualms, has a charming innocence about her – itis the sheer predictability that really affects the book the most. The issuehere is that the only real differences between The Native Star and plenty of other mediocre romance books outthere are the things I listed above, the setting and magic system, and that’sjust not enough to make the book float. The Native Star is an excellent piece offluff, which, despite all its issues, has a fast paced plot that makes it areal page-turner (though aspects of the plot had a haphazard, nonsensical feel to them). This is a book that requires little to no thought and workswell for individuals looking for something to read with a side of popcorn. Youcould read all the words, or skim the pages and glean just as much from them.That sounds like a bad thing, but it’s really not. I read The Native Star on a day where I needed a break from thought andreality and this book fit the bill. It gave my brain a much-needed vacation and I’m honestly not sorry I read it. See, there are times that fluff can work in a book’s favor. 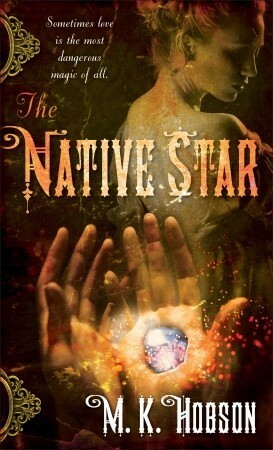 The Native Star is the first book in aseries and honestly, I doubt I’ll continue with it. I don’t see the point. The Native Star is a romance dressedup in fantasy clothes, which is unfortunate. The romance smothers all the gemsthis book holds so much so that they are almost completely overlooked. Hobsonhas a way with words, and the plot is tight and fast paced, the setting isunique and the magic system is interesting. If this book had focused more onthe magic and adventure and less on the romance and the lonely-backwoods-girl-fated-for-something-moreplot it would have really shined. As it is, I feel like The Native Star is a missed opportunity. Hobson had all the rightingredients to make this book shine and stand out from the crowd, but insteaddecided to go cookie-cutter and The Native Star pays for it.